Judge Richard Stockton was the only signer to be put in irons, starved and imprisoned under brutal conditions by the British four months after signing the Declaration of Independence. He paid the supreme price for placing his signature on the Declaration and pledging his life, his fortune and his Sacred Honor. Stockton’s great-grandfather was Richard Stockton, 1630-1707, who arrived in New York with his wife Abigail and son Richard II in 1655. He was a descendant of Sir John Stockton (lord mayor of London in 1470) the Lord of Stockton Manor of Malpas Parish in Chester, England. They settled in Flushing on Long Island. In 1691 he became a member of the Society of Friends (Quakers) and purchased 2000 acres of land in Burlington, New Jersey. In 1701 his son Richard II bought 5,500 acres of land from William Penn in Princeton, New Jersey and settled there with his wife Susannah Witham Robinson. The fifth son of Richard II, eight year old John Stockton inherited much of his fathers land after Richard II died in 1709. 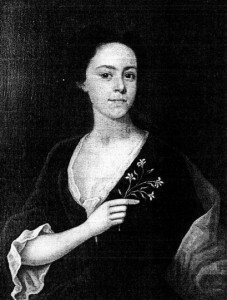 Susannah later married Thomas Leonard and remained in Princeton after her husband’s death. John Stockton married his cousin Abigail and assumed his wife’s Presbyterian faith. John later became a Judge of the Court of Common Pleas. In 1752 John Stockton and his stepfather Thomas Leonard gave money and land to establish the College of New Jersey (later Princeton University) in Princeton, New Jersey. Richard Stockton the signer of the Declaration of Independence was born October 1, 1730 the eldest of eight children born to John and Abigail Stockton. He was educated in the early years by Rev. Doctor Samuel Finley at Nottingham Academy in Maryland, and then attended the College of New Jersey at Newark graduating in 1748 before the college relocated to Princeton. He applied himself to the study of law under the honorable David Ogden of Newark, at that time the most eminent lawyer in the province. Stockton was admitted to the bar in 1754, to the grade of counselor in 1758, and in 1763 he received the degree of Sergeant-at-Law the highest degree of law attainable. He opened his law practice in Princeton in 1754, and later another in Newark and was recognized as one of the most eloquent lawyers in the colonies. Stockton was six feet tall, with green eyes and a slender yet powerful build of an accomplished swordsman and horseman. In 1757 he wed Annis Boudinot, built their home Morven, and later had two sons and four daughters. Annis was descended from French Huguenots; her grandfather fled France at the revocation of the Edict of Nantes in 1685 and settled in New York. Her father Elias Boudinot Sr, apprenticed as a silversmith and merchant, then traveled to the West Indies to run a plantation. There he married Catherine Williams, the daughter of a Welsh planter in Antigua, West Indies. From Antigua they moved to Darby, Pennsylvania where Annis was born in 1736, then moved to Philadelphia where her father established a shop and home next door to Benjamin Franklin. Annis and her brothers attended Franklin’s Academy. Stockton’s oldest daughter Julia wed Dr. Benjamin Rush in January 1776, six months later Rush signed the Declaration of Independence. In 1764 Stockton became the Grand Master of the first chartered Masonic lodge (St. John’s No 1) in Princeton, New Jersey. In June 1766, Richard Stockton sailed to London and for fifteen months traveled in England, Scotland and Ireland. His handsome features and highly polished manners made him very popular. A young English woman Esther DeBerdt, engaged to Stockton’s former law student Joseph Reed remarked, “I like Mr. Stockton exceedingly. He is certainly the cleverest man I have yet seen from America.” In London he attended the Queen’s birthday ball and was presented to King George III, later he had the honor of giving a speech to the King acknowledging the repeal of the Stamp Act and the King was impressed by Stockton. Stockton acquired his personal coat of arms and motto: Omnia Deo Pendent — all depends on God. Stockton’s high character and distinguished abilities preceded him and he was received by the most eminent men of the kingdom. American affairs assumed great importance in England at that time and the opinions of so distinguished an American were sought after. By invitation he spent a week at the country estate of the Marquis of Rockingham and was entertained by the Earl of Chatham, the Earl of Chesterfield and other distinguished members of Parliament friendly to the American Colonies. When Stockton was questioned about America by the secretary of state, he rejoiced that he had nothing to ask of the government “and therefore dare speak my sentiments without cringing. Whenever I can serve my native country, I leave no occasion untried.” He frequently attended Westminster Hall and advised all who would listen that the colonies would never submit to be taxed by the British parliament without representation. While in London Stockton met with Benjamin Franklin and conferred with London merchants on the issue of paper money by the colonies and an act of Parliament forbidding it. On his visit to Scotland he was entertained by the Earl of Levin and other noblemen at Edinburgh Castle and the freedom of the city was conferred on him. While in Scotland as a trustee of the College of New Jersey, Stockton visited Reverend John Witherspoon. Witherspoon had declined the appointment as president of the college because his wife was reluctant to emigrate. Persuaded by Stockton and Benjamin Rush (a medical student in Edinburgh) Witherspoon accepted and became the president of the College, and ten years later signed the Declaration of Independence alongside Stockton and Dr. Benjamin Rush (then Stockton’s son-in-law). Like his father, John Stockton a founder of the College and trustee, Richard served as a trustee of the College of New Jersey for 24 years, as would his eldest son Richard. Two incidents occurred during Stockton’s travels that placed his life in peril. He was attacked one night in Edinburgh by a desperate robber and defended himself skillfully with a small sword. The second time his life was preserved was in Ireland. He booked passage on a ship to cross the Irish channel, his baggage was delayed but it proved to be his preservation as the ship sank in a violent storm and all aboard perished, he later crossed safely. In August 1767 he boarded a ship in London and 26 days later arrived in New York. In 1768 Stockton was elevated to a seat in the royal executive council of New Jersey; in 1774 he was placed on the bench of the Supreme Court. Dreading the possibility of war, on December 12, 1774; he drew up and sent to Lord Dartmouth, Secretary for the Colonies “An Expedient for the Settlement of the American Disputes”, a plan for self-government of America, independent of Parliament but owing allegiance to the Crown. “If something of the kind was not done, he warned Lord Dartmouth, the result would be an obstinate, awful, and tremendous war”. When at last all his attempts to change the minds of the British failed, he decided he must, when given a choice of King or country, choose his native country. He resigned his royal appointments and New Jersey elected him to the Continental Congress in June 1776. In late August 1776, Stockton received an equal number of votes with Mr. Livingston, for Governor of New Jersey; when informed Stockton replied “he had not the least inclination to serve in the office of Governor.” He was then elected Chief Justice of the State and again declined the honor, preferring to remain in Congress and was re-elected to Congress in November 1776. Stockton was an active and influential member of Congress. On September 26th, 1776 he and fellow signer George Clymer of Pennsylvania were sent on an arduous journey of nearly two months duration to inspect the northern army. They were empowered by Congress to contract for provisions, provide barracks, make regulations for hospitals and report back to Congress on the state of the army. They traveled to Albany, Saratoga, Ticonderoga, and every facility necessary to implement their mission, aided by General Schuler, who commanded the northern army. They found the army in need of all necessary things and Stockton reported this to John Hancock. There was no place to acquire these items and unfortunately no money to purchase them with if they were to be found. The continental army had to depend on Congress and the states to provide for them, and help for the army was slow in coming if it came at all. Stockton wrote fellow signer Abraham Clark “Dear Sir, Before I left Philadelphia Congress appointed a Committee, consisting of one member from each state, to devise ways and means for furnishing the Army with clothing and etc. As the member appointed for New Jersey, I laid the resolution before our Legislature then sitting at Princeton, and recommended to them the great importance of their approaching persons in every county. They were pleased to take up the matter with that zeal which the nature of it required and determined to take every step that they might in this endeavor to more effectually and speedily execute the business. I hope therefore that already a considerable quantity of shoes and stockings at least may be provided and that you will take immediate order for the sending of the parcels. Col. Dayton’s Regiment is moved from Fort Stanwix to Tyconderoga the Col and Major Barber came here last evening and the Regiment is now a few miles of this place, marching with cheerfulness, but a great part of the men barefooted and barelegged. My heart melts with compassion for my brave countrymen who are thus venturing their lives in the public service and yet so distressed. There is not a single shoe or stocking to be had in this part of the world, or I would ride a hundred miles thought the woods, and purchase them with my own money—for you’ll consider that the weather here must be different from that in New Jersey; it is very cold now I assure you. For God’s sake my dear sir, upon the receipt of this collect all the shoes and stockings you can, and send them off for Albany in light wagons; a couple of two horse wagons will bring a great many, which may be distributed among our several Regiments who will be all together at Tyconderoga in a few days – if any breeches, gloves and coats be ready send them along; but do not wait for them if the shoes and stockings are ready, and the others not—we have dispatches from General Gates this morning informing that he hourly expects to be attacked by the Enemy; but our works are very strong and a Boom thrown across the water from Tyconderoga to prevent the enemies shipping from getting below us, therefore I trust with the blessing of Almighty God, that we shall disappoint their wishes and sanguinary purposes—But shall the brave troops from New Jersey stand in lines half leg deep in snow without shoes or stocking—God forbid. I shall empty my portmanteau of the stockings I have for my own use on this journey, excepting a pair to take back home, but this is a drop of water in the Ocean.” Richard Stockton’s heartfelt compassion for his fellow countrymen in dire need of everything was apparent in his letter as he was one of the few signers that actually traveled with the Continental Army. The British invaded New Jersey and Stockton rushed home and moved his family to the home of a friend thirty miles from Princeton. He was captured there November 30, 1776 by loyalists in the dead of night, drug from his bed and marched in freezing weather clad only in a nightshirt and breeches. He was turned over to the British and jailed in Perth Amboy first, then sent on to prison in New York. The darkest days of his life were spent locked in irons, starving and shivering in the cold winter of 1776-77 in the notorious Provost prison in New York City. Conditions were horrific in prison where over 12,000 men died in prison ships and prisons in New York compared with 4,435 battle casualties during the entire war. Lately Stockton has been maligned by a few writers claiming that Stockton took a pardon from General Howe and swore allegiance to the king. This claim is based on a private letter quoting a rumor spread by an enemy of Stockton. There is absolutely no proof this occurred. In March 1777, only two months after Stockton’s release, in a letter to British Parliament General Howe wrote “at no time had a leading rebel sought pardon.” The book His Sacred Honor comes to Stockton’s defense against these revisionist writers using rumors and innuendo to spread this false claim against a founding father. Stockton’s home “Morven” had been occupied by British General Cornwallis. Dr. Benjamin Rush wrote: “The whole of Mr. Stockton’s furniture, apparel, and even valuable writings have been burnt. All his cattle, horses, hogs, sheep, grain and forage have been carried away by them. His losses cannot amount to less than five thousand pounds.” Stockton’s library one of the finest in the colonies was burned and he was forced to accept help from his family and friends to survive. Because of Stockton’s poor health and the parole requiring him not to participate in the war effort he resigned from Congress. Dr. Rush wrote that it took Stockton nearly two years to recover his health. He was buried at Stony Brook Quaker Cemetery in Princeton, New Jersey among his Quaker ancestors. In 1913 a handsome bronze marker was placed at the site by the Sons of the American Revolution. Annis Boudinot Stockton was one of America’s first female published poets. She was a close friend and favorite correspondent of General George Washington. One of her poems about General Washington, on the surrender of Lord Cornwallis, shows how highly Washington esteemed these complimentary writings by the letter he wrote Annis. “Philadelphia, July 22, 1782. Madam, Your favor of the 17th, conveying to me your pastoral on the subject of Lord Cornwallis’ capture, has given me great satisfaction. Had you known the pleasure it would have communicated, I flatter myself, your diffidence would not have delayed it to this time. Amidst all the compliments which have been made on this occasion, be assured, madam, that the agreeable manner, and the very pleasing sentiments in which yours is conveyed, have affected my mind with the most lively sensations of joy and satisfaction. 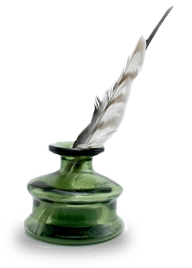 This address, from a person of your refined taste and elegance of expression, affords a pleasure beyond my powers of utterance, and I have only to lament that the hero of your pastoral is not more deserving of your pen; but the circumstance shall be placed among the happiest events of my life. I have the honor to be, madam you’re most obedient and respectful servant, G. Washington.” Many of the letters they wrote are included in Stockton’s Biography His Sacred Honor. Annis was the only woman to be made a member of the American Whig Society. Annis Boudinot Stockton died February 6, 1801 surviving her beloved Richard by nearly twenty years. Elias Boudinot, brother of Annis, married Stockton’s sister Hannah, and was trained as a lawyer by Stockton. In 1772, fifteen year old Alexander Hamilton arrived from the West Indies and lived with Elias and Hanna for two years. Boudinot was appointed by General Washington to be commissary general of prisoners in the Revolutionary Army 1776-1779. Boudinot became a member of the Continental Congress in 1778, and President of Congress in 1782-83. On August 23, 1783 George Washington attended the public reception by Congress in Princeton. The black gowned students of Princeton surrounded the door to Nassau Hall and cheered as Washington entered. The gallery was crowded; the floor was reserved for members of Congress; and on the wall hung the empty frame of the portrait of George II, which Alexander Hamilton’s cannon ball had destroyed in the fighting of January 3rd at the battle of Princeton six years before. Two members conducted Washington to a chair beside President Elias Boudinot, who remained seated on the platform, with his hat on his head to symbolize the superiority of the civil authority over the military. When the General had seated himself, Boudinot proceeded to read an address of welcome. From the pocket of his close-fitting coat Washington drew his carefully written reply. He read it, and the simple ceremony was over. Paintings of Richard Stockton, George Washington and Elias Boudinot hang in Nassau Hall to this day. Boudinot again served in Congress from 1789-1795. Elias Boudinot is responsible for our Thanksgiving Holiday, he proposed in 1789 in the United States House of Representatives, a resolution that we officially celebrate a day of public thanksgiving. President Washington later issued a proclamation designating a day of prayer and thanksgiving. Boudinot also served as Director of the Mint, and became the first president of the American Bible Society in 1816. Elias Boudinot served his country in many positions during the difficult times of the American Revolution. He died October 24, 1821. A statue of Richard Stockton by Henry Kirke Brown. A statue of Richard Stockton by Henry Kirke Brown was dedicated by congressional proceedings in 1888 and placed in Statuary Hall in the Capitol Building in Washington, D.C. Stockton is one of only six signers to be so honored. In the famous painting “The Declaration of Independence” by John Trumbull in the Rotunda of the U.S. Capitol, Richard Stockton is standing on the far left side of the painting the third figure from the left. In Washington, D.C. near the Washington Monument there is a memorial park to the signers with 56 granite boulders, each engraved with the name of a signer. There is a Richard Stockton Rest stop on the New Jersey Turnpike with his portrait and a short story. The Richard Stockton College of New Jersey is named in his honor. Richard Stockton’s home “Morven” became the New Jersey Governors Mansion from 1954-1981. Morven is now a State owned Museum, a magnificent home which stands today as a testimonial to the Stockton family. 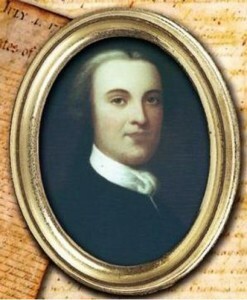 Richard Stockton’s eldest son Richard became a New Jersey senator and Stockton’s served in Congress for four generations. Richard Stockton’s grandson Commodore Robert Field Stockton conquered California, became its first military governor in 1846, and in 1851 served as a Senator from New Jersey. This entry was posted in New Jersey, Signers by state. Bookmark the permalink. Extremely fascinating and informative. i’m researching our family tree, as my maternal grandmother was a stockton, and her great-great grandfather was andrew hunter stockton, and, ironically, she married a vermont farmer , surname Annis, and was therefore hazel stockton annis! who knew? Martin can find no record of any of these names in the Stockton the Signer genealogy. Kimber, all I can suggest is that you go to http://www.google.com. When you get to that page, look at the menu in the upper left of the page and you will see an item, “More”. Click on that, then when you get that page up, do a search for the book. I assume you have already done a regular google search for the book. 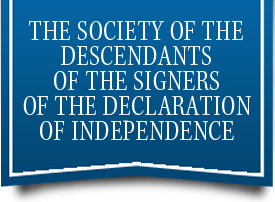 My family has been arguing about whether or not we are descended from Richard Stockton, signer of the Declaration of Independence. As far back as I have been able to ascertain, we are related to John Knox Stockton and, according to my grandfather, Thomas James Stockton (1878-1959), also to Frank R. Stockton, author of “The Lady Or The Tiger.” Other family names: Lincoln and Lily, my grandpa’s siblings. John Kenneth, Richard and Roger, grandpa’s children. How would I go about finding this information. My great-grandmother was a Stockton from this line and if you’re family has never mentioned Commodore Robert Stockton or his son John P. Stockton (a senator) I would guess you’re not from this direct branch. The Commodore was pretty notorious as he almost blew up a sitting president so he’s not one a family would forget about. If you do some digging I know a distant cousin has a genealogy site that lists quite a few generations of direct descendants, I just can’t seem to find it at the moment. Hope this helps!